After Eliza accidentally enchants Jake, they set rules to keep his arrow-struck desire at bay. But before long Eliza is rethinking her stance on true love, and realising that some rules are meant to be broken. Eliza Herman has spent years avoiding her calling as a Descendant of Eros. After all, happily-ever-afters are a myth. 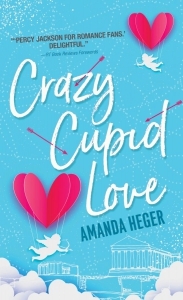 But when a family crisis requires her to fill in at her family's Cupid-for-hire shop, Eliza finds herself enchanting couples under the watchful eye of her grade school crush and fellow cupid, Jake Sanders.